PRO STRIP | Pro Chem, Inc. 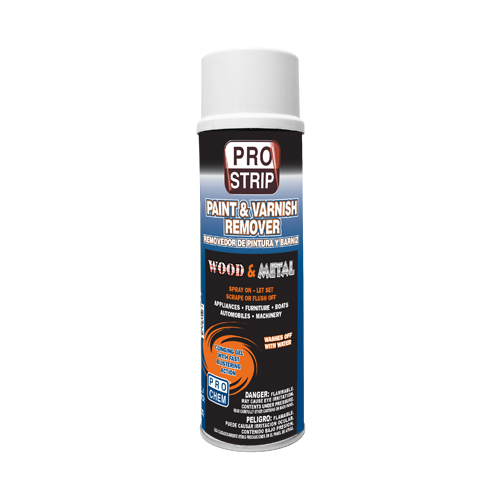 PRO STRIP is a powerful clinging gel that quickly blisters lacquers, enamels, shellacs and acrylics without attacking substrates such as wood, metal, masonry, stone or ceramics. The blistered paint can then be easily scraped off or flushed away with water. It also allows for easier gasket removal. Just spray on and let stand for 3-5 minutes for the product to soak into the gasket, allowing the active ingredients to work and release it from its seated surface. Clean off dirt, grease or heavy oil. Make certain surface is dry. To avoid possible skin contact, do not stand downwind of spray or mist during application. Hold can 8 to 10 inches from surface. Apply a heavy, even coat to entire surface. Allow product to remain on surface for several minutes, even after blistering action has occurred. Remove residue with a scraper, putty knife, cloth or a strong water spray. If necessary, repeat application after surface is dry. Clean valve by turning can upside down and applying short burst.